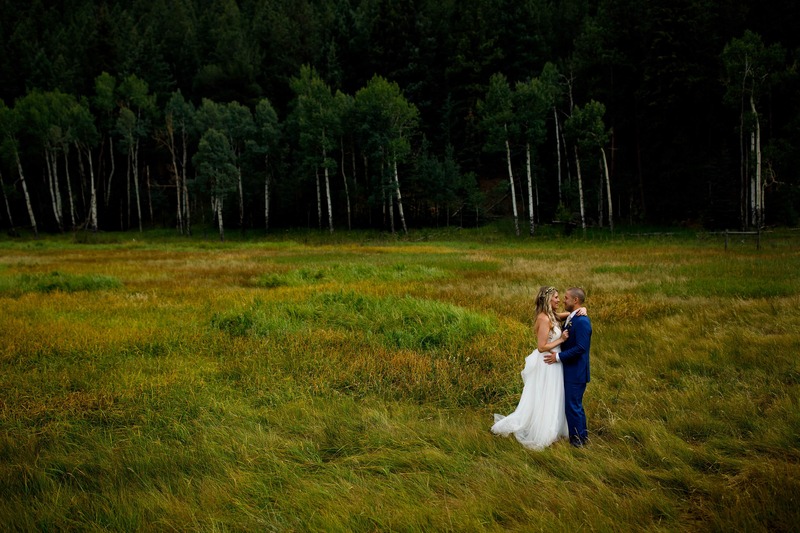 Deer Creek Valley Ranch is a mountain wedding venue in Bailey, Colorado that is home to two venues, The Barn and The Homestead. The Barn at Deer Creek Valley Ranch and The Homestead (new for 2019), each offer rustic outdoor and indoor spaces to accommodate your wedding. Located along Highway 285 in Bailey, it takes just under an hour to get there from downtown Denver. Although the entrance is just off the road, all the ceremony locations are hidden further back on the expansive property. Each of the venues at DCVR feature separate bridal and groom suites. The Barn features two outdoor ceremony spaces, the Mountain Bridge Meadow and Lakeside Gazebo. In the event of poor weather, the Barn Hayloft serves as the backup. The brand new Homestead offers an outdoor ceremony location surrounded by pine trees and boulders overlooking the valley. The reception space is capable of hosting up to 140 guests. DCVR is close enough to Denver but still provides some of the mountain feels that many couples are looking for. If you're looking for a casual vibe, this could be the venue for you. Try to plan your first dance outside on the patio at twilight under the market lights for a truly special moment.